Summer is nearly here which means fresh berries are becoming more and more abundant and that makes me super happy! I’m always so disappointed when I grab a beautiful pint of strawberries- bright red, not bruised, and cute as a button… but I bite into it and grimace at the sour taste of betrayal as I look at the bright white center. That’s what I get for trusting beautiful red strawberries in the winter months. I take it as a personal offense when that happens. Where was I going with this? Oh yes… Whenever I am faced with a disappointing batch of strawberries I have to find a way to bring some life into them. Cue copious amounts of sugar and a healthy dollop of butter. This dessert is seriously so delicious and incredibly easy! Anybody you share it with will become your best friend and probably try to steal the leftovers from you. I am totally obsessed with these cupcakes, and for good reason! If you love those sinfully delicious chocolate snack cupcakes with the perfect white swirls on top and the delightful cream filling then my tricky copycat recipe is for you! This recipe is extra sneaky because I like to save myself some trouble and use a cake mix and store bought frosting. If you don’t like the idea of using those items then feel free to use your favorite chocolate cupcake recipe and marshmallow frosting. I won’t feel bad! Alright, alright I know it’s January 3rd… yes I know the holidays are over (you don’t have to rub it in). 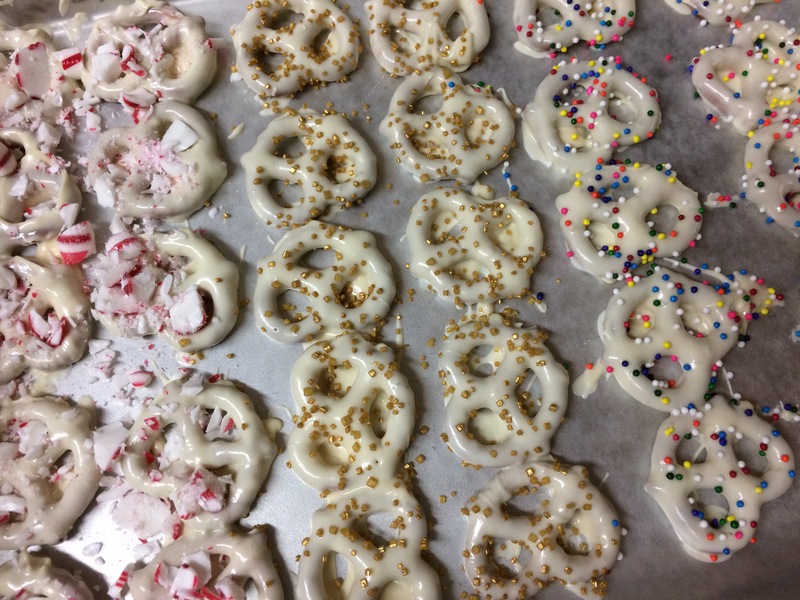 But I promised I would share some step-by-step photos of the holiday treats I posted and now you can day dream about them all year until next December. Holiday baking is in full swing! I have baked dozens of cookies over the last week and eaten way more than I am willing to admit to. You’ll have to torture the number outta me! But please, whatever you do, don’t take away my cookies! While the oven is running nonstop it is nice to have a good holiday treat that doesn’t require baking. That’s where the simplicity of rice crispy treats and candy dipped pretzels come into play. They are so delicious and easily customizable for any occasion, I just can’t get enough of them. I didn’t end up having Sam help me this year but both of these treats would be fun to make with your kiddos. Maybe next year he will be ready, this year I can only imagine the horror of unleashing him on these treats. It would be chaos! Now, I apologize in advance for my scatterbrained nature. We are at the grandparents house for Christmas and just guess what I forgot… my computer. My how-to photos for these treats are on my computer back at home and I am typing this on my phone and hoping that the pictures on my phone will be sufficient for now. I pinky swear that I will share the how-to photos with you as soon as I can! Anyways, back to the treats. First, let’s talk about these Christmas tree rice crispy treats! Remember the recipe for rice crispy treats I shared with you the other day? Of course you do! Start with a nice big batch of rice crispy treats and after they have set up cut them into triangles. Or, if you’re not scatterbrained like me, I know we covered this already, use a Christmas tree cookie cutter to make them even more adorable! Break up a few candy canes and insert a short “trunk” into the bottom of your trees. Next, grab some green candy melts and follow the melting instructions on the bag. Once melted, drizzle the candy over the rice crispy tree in a fun and wild pattern. Drizzle as much or as little as your heart desires. My heart desired a lot more candy than I allowed myself to use so what I’m saying is I don’t want you to miss out on that opportunity like I did. Before the candy sets grab what ever sprinkles or decoration you’d like to use and go to town! I just used sprinkles this time but you could also attach mini m&ms or crushed candy canes or leave the tree unadorned. Once again, follow your heart. If you possess large star sprinkles use a dab of green candy melts to attach the star to the top of the tree. I had no luck finding the stars, even though I looked at 2 stores, and ended up just using some gold sprinkles. Ah well, they still taste good! Now, let’s look at these candy coated pretzels! 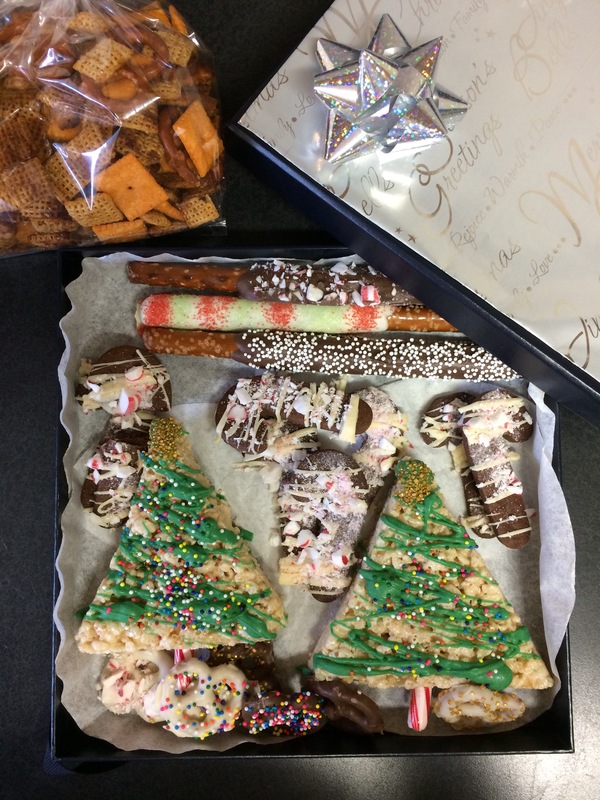 Grab melting chocolate, almond bark, candy melts etc. and get them all melty melty according to the package directions. 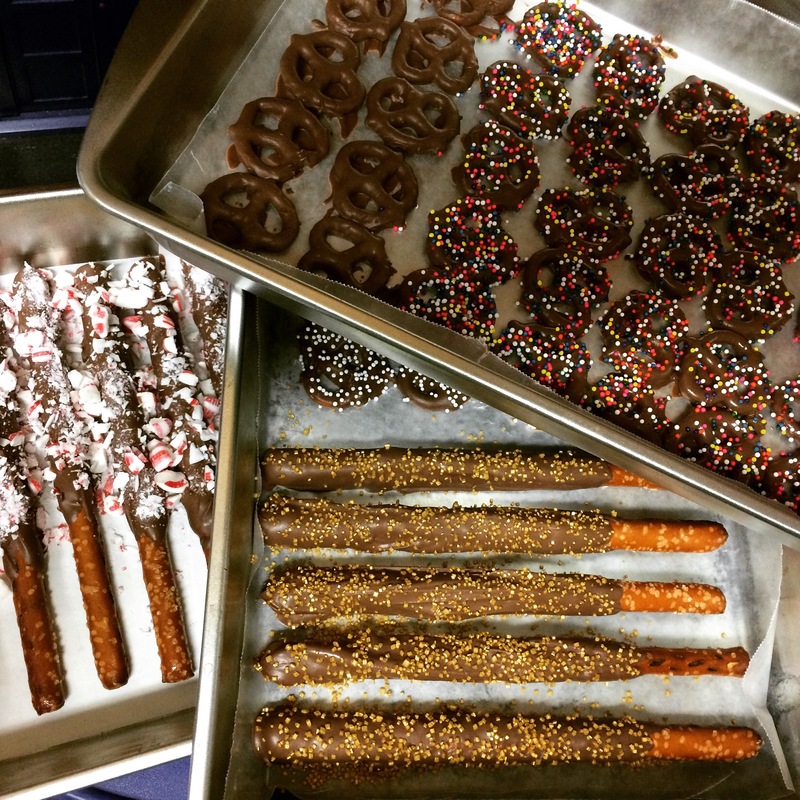 Dip your pretzels and sprinkle wildly with sprinkles, crushed candy, different candy melts, or even chopped nuts! If you’re planning to hand out Christmas treats to your family and friends don’t bother spending extra cash on decorative boxes. If you are an obsessive box collector like I am you probably have the perfect treat boxes ready to use! This box was left over from Sam’s baby shower (2 years ago, yikes!) 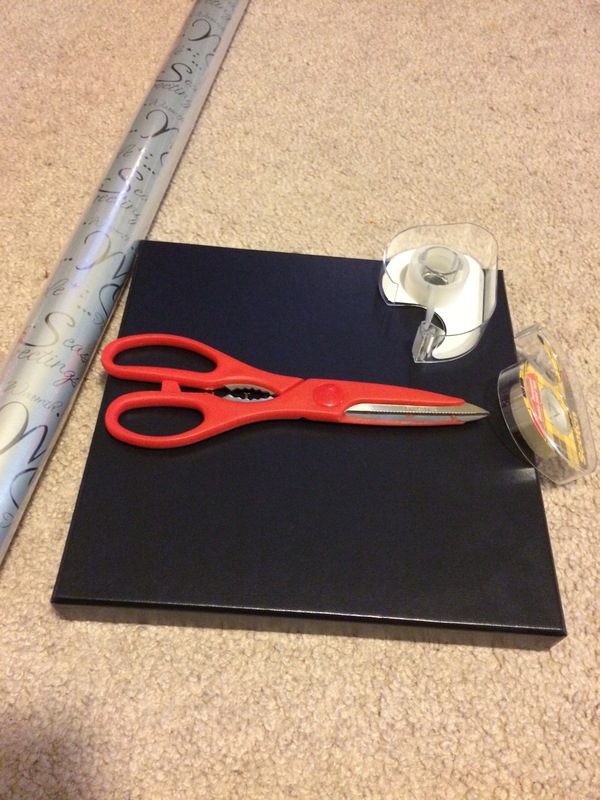 and I grabbed some tape, scissors, and pretty wrapping paper. 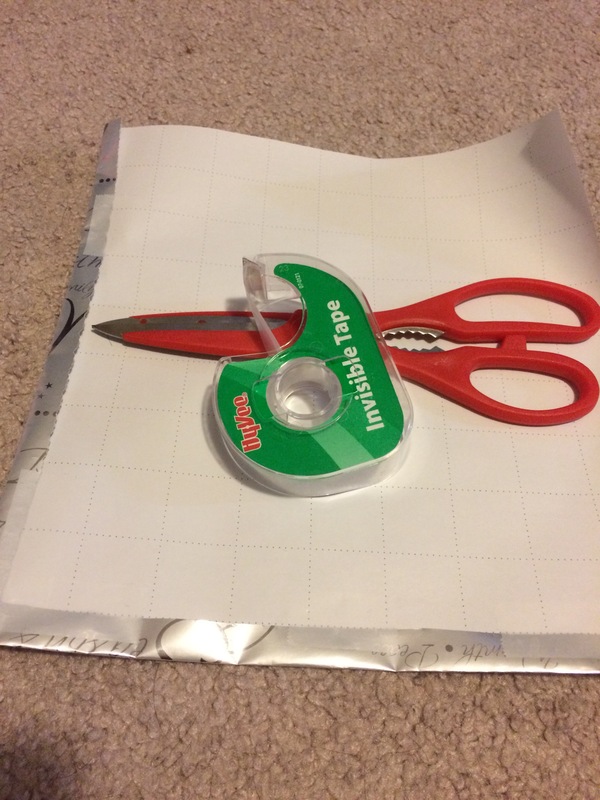 Trace the top of the box onto the wrapping paper and cut it out. To clean up the edges a bit fold over a 1/4 inch and tape it down. 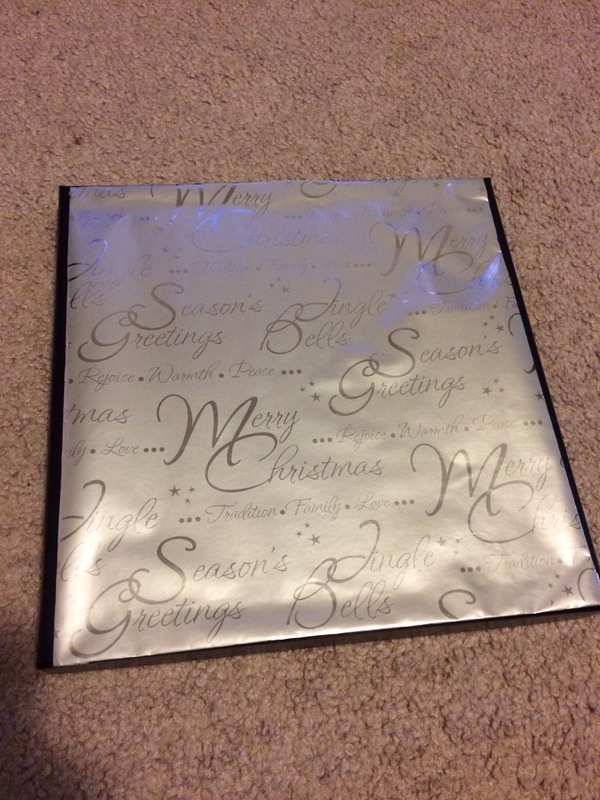 Tape the wrapping paper to the top of the lid with double sided tape. Pretty! Add your treats and a bow! Ta-da! 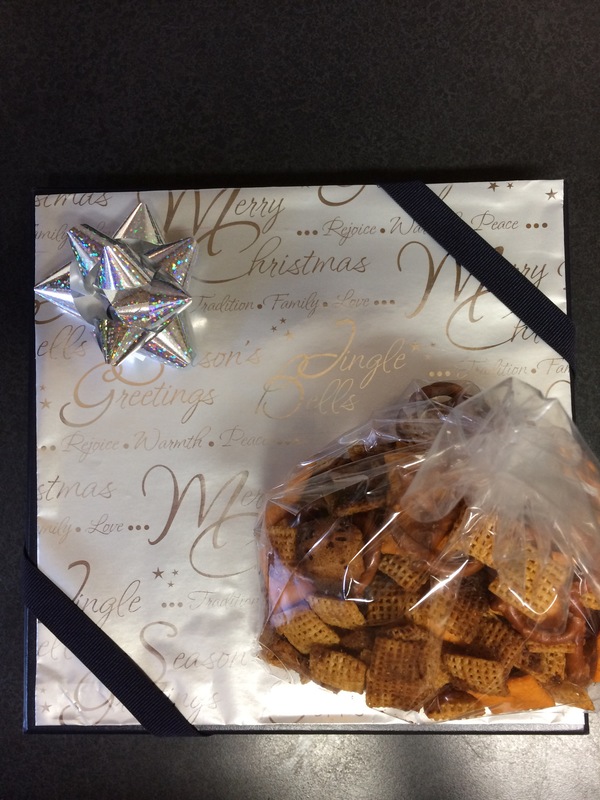 I also made chocolate candy cane cookies and my favorite spicy cereal party mix to give to our friends. Delicious! Have a merry and delicious Christmas! What makes rice crispy treats so gosh darn delicious? I’m sure it has nothing to due with the copious amounts of marshmallows. Instead of spending extra money on these treats from the store you should try making these delightful goodies yourself. They are unbelievably easy, so delicious, and cheap! Last week we had friends over for dinner: I was in charge of the meal and they brought dessert, a fantastic arrangement in my humble opinion. Our friends bought a version of this delicious dessert from the grocery store and as soon as I took a bite I knew I needed to make this ASAP! Directions: Place all of the cookies in a large Ziploc bag and crush them with your hands or a rolling pin. In a deep pie dish spread all but a handful of the crushed cookies, press down lightly. This is your crust. Next, mix the pudding powder with milk until completely combined. Before the pudding starts to set, pour it over the cookie crust. Refrigerate the pudding for at least 1 hour to allow it to set. Once the pudding has set spread the entire container of cool whip over the top. Lastly, sprinkle with the last of the crushed cookies. To serve, scoop a healthy sized portion into a bowl and enjoy. Here is our cast of characters for this delightful dessert. Seriously? Can this be any more simple? Toss all of them cookies into a bag, now is a good time to get out all of your frustrations over how your toddler seems to turn his nose up at all of the healthy food that you so lovingly prepare for him. I just used my hands to crush and smash and crunch my cookies. Feel free to use a rolling pin, a can of green beans, your son’s toy hammer… you know whatever is laying around in your kitchen. These cookies were still kind of large but feel free to crush them even more if you want. Spread most of the cookies into the bottom of your serving dish. Reserve a handful of crushed cookies for topping. Now mix your box of pudding with 2 1/2 cups of whole milk. Don’t let it set up just yet, work kinda quickly. Pour the pudding mixture evenly over the top of your cookie crust. Chill the whole kit-and-caboodle for at least 1 hour to allow the pudding to set. Spread the whole container of cool whip over the top of the pudding. Don’t be shy my friends! Last, but certainly not least, top with the last of the crushed cookies. I don’t know what you’re having for dessert because I plan on eating the whole thing myself! If you’re actually going to share this dessert, grab the biggest spoon you can find and dish it up to the hoard of hungry guests waiting outside of your kitchen. It’s not much to look at but oh heaven help me it tastes soooo good. If you’re looking for a quick and simple dessert for your family or a potluck, this dish will certainly be a winner. Are you ready for fireworks, family, barbecues, and summer fun? I sure am! I may be an adult but I still gaze in childlike wonder while watching fireworks. This year we will be splashing in the pool, riding the tube on the lake, eating copious amounts of delicious summer foods, and enjoying the company of our family. I also take this opportunity to make super fun holiday themed treats to share. I can’t trust myself to make too many treats just for our little household, it’s hazardous to my health to keep too many goodies at hand. So I love having the excuse to make treats and share them with everybody. Along with cake balls and cookie pops I am also bringing these fun hard candies to enjoy. Sometimes you just need chocolate… and sometimes you need that chocolate to come easily. So a box of brownie mix comes into the picture… but wait… how can we make this a little more interesting? How about we vamp up that brownie mix and turn it into something gloriously and sinfully delicious? Sounds like a plan! This happened to me last week. I normally don’t crave chocolate but when I do it hits me by surprise. Thankfully, I had a box mix hiding in my cupboard that was just begging to be played with. I also found a package of Heath Toffee bits (YUM) and to make it even more fantastic I grabbed the instant coffee.